Stress Awareness Month 2012 (April 1-30) will feature the release of a free College Stress Relief E-Book, written by Dr. Mort Orman, M.D. and targeted to all college students and high school seniors. This year marks the 20th year in a row that April 1-30 has been officially designated as National Stress Awareness Month (http://stressawarenessmonth.com). During this thirty day period, stress experts and other health care professionals are encouraged to join forces to increase public awareness about both the causes and cures for our modern stress epidemic. Sponsored each year since 1992 by The Health Resource Network, Inc. (HRN), a non-profit health education organization, Stress Awareness Month is a national, cooperative effort to inform people about the dangers of stress, successful coping strategies, and harmful misconceptions about stress that are prevalent in our society. “Even though we’ve learned a lot about stress in the past,” says Dr. Morton C. Orman, M.D., Founder and Director of HRN, “we still have a long way to go.” According to Dr. Orman, there are many new ideas about stress that are not well known, but that could help millions of Americans eliminate their suffering. Dr. Orman has invited leading health promotion advocates and health education organizations across the country to develop and disseminate helpful educational materials about stress during the month of April. He is also encouraging stress experts and other health care leaders to conduct public forums, discussion groups, and other informative community events. For his part this April, Dr. Orman will be focusing his individual stress awareness activities on helping college students learn how to better understand and deal with stress. 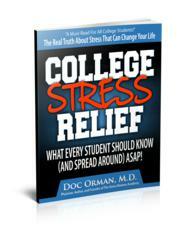 He will be releasing a new, downloadable PDF e-book on Monday, April 2, 2012 titled College Stress Relief: What Every Student Should Know (And Spread Around) ASAP! This free e-book, which is targeted to college students and high school seniors, can be downloaded and shared from http://collegestress.net beginning April 2nd. For more details about National Stress Awareness Month 2012, please visit http://stressawarenessmonth.com. The Health Resource Network, Inc. (HRN) is a small, privately-owned, non-profit health education corporation (501C3), founded in Baltimore, Maryland in 1982.